Last Friday afternoon I had settled on the couch with the dogs for my afternoon rest, completely unaware that space and time were about to open a gate into the phenomenal and timeless. Although I call it “Nap Time” in an older post, my afternoon rest does not always mean I fall asleep, although often I do. It does mean that I get on the couch with my feet up, and stay off them for at least an hour, often two, resting, reading, sometimes saying my cosmic rosary, sometimes reading online or drafting a blog post or even a grocery list. In times gone by on Asbury Street it might sometimes mean I’d sketch something with just one color, something I could see in front of me, since sketching can be relaxing. And always it means the dogs rest with me too. The enchantment started a couple of days before that when I’d first watched a video of orcas appearing before a boat in the Salish Sea. The video is recorded by a mother as she and her children watch a pod of orcas purposefully approach them, and then swim past very close by. At least one of them goes right under the boat. As the pod of orcas approaches and it becomes clear how close they will be, the humans on the boat are overcome. The mother is only able to gasp and whisper “oh my god” over and over, and the children are reduced to utterances that sound like a mixture of wonder and ecstasy, with a dash of terror–not unlike speaking in tongues. Meanwhile, as the orcas move gracefully in synchronized tandem with each other and the currents, the air is punctuated by their breathing and the appearance of their fins, each a little differently shaped. As I listened to them breathe, I felt as if that breath was breathing in me, or sounding in my rib cage the way the Native American drums and chants do when I have been lucky enough to be close by and listen as they perform. I listened and watched again and again. Those of you who follow my blog’s facebook page may have noticed my posts following the tragic death of the baby orca and her grieving mother’s vigil of mourning. For 17 days and over a thousand miles she carried her dead calf with her until finally she was ready to let go. Like so many people around the world, I felt her sadness and cried tears for her loss, for our loss. I have long known the Southern Resident Orca population in the Salish Sea has been slowly starving, for lack of Chinook Salmon. Human fishing, dams, busy shipping lanes with oil tankers and increased toxins in the water have all made it less and less possible for these creatures to find the food they need. This population feeds primarily on wild Salmon and not sea mammals, and they have been unable to produce a calf that lives in the last 3 years. The youngest member of their group, a 3 year old called Scarlett by the researchers, is extremely emaciated and scientists are concerned she is starving. She has recently been darted with antibiotics to stave off an infection, and even more recently the Lummi nation’s plans to present her with wild salmon to feed on were successful. In decades past, this same population was decimated by human cruelty and greed when in the sixties and seventies several young calves were taken away from their families and captured to perform in places like Sea World. Only one of those whales, Tolkitae, survives. She is now 47 years old, and her mother Ocean Sun, still lives free. The people of the Lummi Nation and others are still advocating for Tolkitae to be freed and reunited with her mother. They are prepared to make that happen successfully. So this isn’t the first time a virtual encounter with their wisdom has caused me to use words like “spellbound” and “magical” as I felt their impact on me all the way down in my bones. I’m also blessed to know science writer and novelist Rachel Clark, who wrote a riveting young adult novel called The Blackfish Prophecy, which I highly recommend. It’s through her friendship that I was able to view the video that catapulted me into the experience I’m trying to put into words here. I’ve been writing postcards to voters off and on for a while now, so when I came across a comment on Rachel’s feed that there was going to a postcard campaign to help the orcas, I jumped right in, asking questions about when and where and other logistics. And as I got the basic information, the inspiration to do a drawing I could make into my very own postcard became impossible to resist. For a few days already, I had been watching and rewatching that video. I was already aware I wanted to draw something inspired by it, so I began by watching it yet again, to try and find a place I could stop it that would give me something I wanted to work with. Once I had accomplished that, I got up off the couch to collect the materials I would need and bring them back to my resting spot. 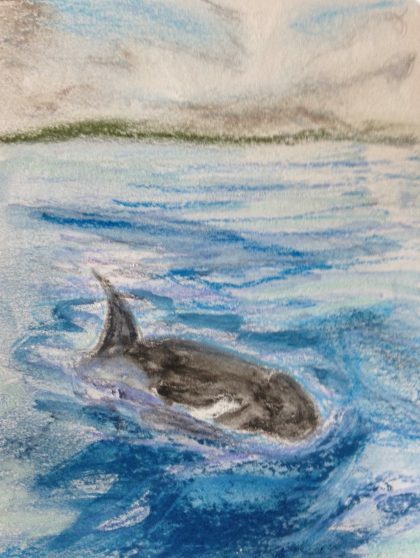 In a state of enthrallment with the patterns on the whale and the way her body marked the water and light around her, I made the basic sketch in water soluble colored pencils. At this point, further mesmerized by the pattern of waves and light on the water in the video, I got up to open my watercolors and never sat back down again. A little watercolor here, a little chalk pastel worked with the finger or the brush there, and the drawing at the top came to life. I might have stopped there, but I was possessed by an extreme form of focus and sense of discovery, as if being carried by a current myself. Something drove me on to take a photo of it right away, and begin the process of figuring out how to get it to print as a postcard size image I could either print on its own or paste onto an existing postcard. And as it turns out I was able to do both. By this time I had pretty much used up my nap time in this creative state of enthrallment. I hadn’t noticed how long I’d been at it, but afternoon was turning into early evening and somehow I had managed to print out 4 images I could use for the 4 postcards I would need to ask for controlled breaching of the earthen embankments of two dams this year. And then I received two messages, simultaneously, from my family. One was my son, whose birthday it was, saying he had decided to drive out to the coast to see me that night after all. That meant I needed to get on the promised pizza and cake with whatever I happened to have in the house in the next couple of hours. The other was from my sister, who had told me earlier she was not feeling well and was headed to the emergency room. She messaged me to say it was indeed her appendix and she would not be going home until they took it out. The next 24 hours would be devoted to my son and to my sister. So if felt like no “fluke,” yet again, that this timeless time tunnel had opened up for me to draw, and then photograph and format and print, as if in a trance, the images I would need to participate in the campaign come Monday morning. That done, I was now free to turn my attention to my family. A late night birthday celebration was a success and so was my sister’s surgery. When I returned to the home made cards later in the weekend to write the required message and address them to Washington’s governor, two senators and the Corps of Engineers, I was so tired that I found it hard to be pleased with my handwriting, the way I signed them, or if they were up to par to be mailed at all. This often happens with things I make and I’ve learned it’s best to “sleep on it.” I put them all under a huge heavy book to flatten out, and I went to bed, consciously attempting to disengage myself from my criticisms and judgments. The next morning things looked better to me, but for some reason I was still in a tither about whether they’d make it to the mailbox in the satchel I usually carry outgoing mail in (along with a sandy grubby dog toy and other goodies) without getting bent, wet, or marred by ever present loose sand. I even fretted about which envelope to transport them in to the mailboxes and finally chose the one I use for postcards to voters. As the dogs and I walked down our street with the postcards inside the satchel over my shoulder, I felt a “someone” communicating to me, inside my head yet also across water and through water, with language, but also beyond it: what does a little sand or a little warp of the material matter? it is part of us. we are of the ocean. we are of the water. It was spooky, and yet comforting, and wonderful, and perfect. I knew it was somehow the energy of the orcas, reassuring me that any way my cards carried traces of the beach or the actions of moisture would also help carry their essence and therefore their urgent need to the bureaucrats who need to hear it. My shoulders relaxed and I smiled. I even laughed out loud a little at how “perfect” such imperfections actually are in this instance. And thus, like I do when I feel my mother or my father’s spirit, or in the way I might pick up the thought of a friend who is not present, I came to know the orca energy was with me, and in a way I had embodied it, called it in to me, through my drawing. It’s very hard to put into words, but it did not surprise me. The longer I don’t eat animals, the more opportunities I am given to spontaneously tune into flashes of “who” they are. I’m reminded of the times I watched and drew the chickadees taking a bath in a terra cotta saucer outside my sliding glass door who were aware of me and seemed to be “letting” me, or when I said out loud to a drawing of a stellar’s jay I tried to do from memory that I’d hoped I’d done it justice. Soon after that, one hopped back onto the table outside the window as if to say, yes, you got me, thank you. I’ve never seen an orca in the wild. When I was a little girl and knew no better, I did see one at Marine Land, which I never forgot. It is possible to see them wild here from the shore once in a while, some of my neighbors have, but I haven’t been so lucky. And I would count myself lucky, despite wishing the gray whales migrating past our shores safety from their predation. They have cast their orca spell. And then they have thanked me, across space, across time, and outside of it, too, for my humble efforts. I’m a very lucky human, to have such a powerful and generous line of ancient animal wisdom and ancestry pay any telepathic attention to me at all. I hope my small drawing and my sacrifice of one nap somehow makes a difference in their imperiled lives. I hope they, of the ocean, go on swimming and breathing in it, long past a time I’ll be here to remember it. Oh Maria, the recounting of your beautiful experience had me spellbound & feeling magical too. What a gorgeous multi-layered art piece you created while connected to the divine spirit. I loved reading about your intense empathy towards the orcas & all living creatures really. Thank you for allowing us to share so much of your extraordinary life! It is a true gift to be able to recount one’s feelings & actions (even the mundane) in such a colorful & relatable way. Debra, my goodness, thanks so much for these very kind words–I am so pleased to know that you, too, were spellbound as you read. I so appreciate this! That orca carrying her dead child… I wept all over again. My heart is so exhausted. A few years ago, Mark and I went to the San Juans and went kayaking – just two of us and a guide. We stopped in a kelp bed to watch the orcas that were a ways away. All of a sudden, there are two of them – a mom and a baby – who changed direction and started coming towards us. Closer and closer, and we just held on to our pieces of kelp to steady the boats, as the mom and baby breached not 50 feet from where we were. It was one of the most incredible things I’ve ever experienced. It’s like they came to say hello, and then off they went, back to the pod. I learnt a lot from following your links; I wish my sadness could be transformed into something that would regenerate the orca pod in the Salish Sea. Thank you Deborah. You can always write to the Governor of Washington or the Orca Task Force yourself and ask that they take steps to save those orcas from starvation. They need our voices.